Tesla delivered a disappointing 63,000 cars last quarter, 31 percent less than it had the quarter before. The miss sent the stock down about 8 percent. Obviously, a decline in sales is not great, but Tesla’s current success depends a lot on how you look at the company. Tesla’s sales are a drop in the bucket compared to major car producers. In North America alone, Toyota sold nearly as many cars in the last month of 2018 as Tesla sold globally the whole year. Last quarter, Ford sold more than nine times as many vehicles in the US than Tesla did worldwide. The Model 3, despite not really having all the creature comforts of a luxury car, is still very much a luxury car in price and perception. Only this year did Tesla finally deliver the long-awaited mass-market $35,000 Model 3. Even at that price, it’s more than the average new vehicle. Thanks to upgrades, the average selling price has been nearer to $60,000. In March, Tesla announced its next vehicle, the Model Y, a much needed “affordable” SUV. Like the Model 3, more expensive versions of the Model Y will be released first and even its base price is pretty high at $39,000. Tesla CEO Elon Musk in his last earnings call predicted a demand of more than 500,000 Model 3s in 2019 and expects demand for Model Y, which won’t come out until fall of next year, to be 50 percent to 100 percent higher than that. In the latest report, Tesla reaffirmed its guidance of 360,000 to 400,000 2019 vehicle deliveries. That goal is going to be harder now that it’s missed first-quarter expectations. 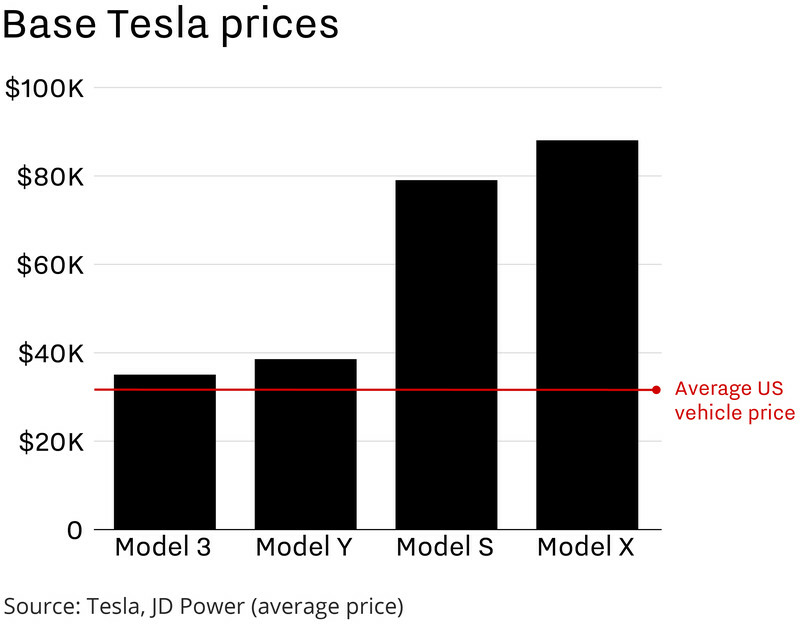 But if Tesla hits those estimates, that would put its vehicles in best-selling car, not just luxury car, territory. But for Tesla optimists, this all fits in with Tesla’s master plan, which Musk laid out 13 years ago. Despite that demand, Tesla noted in its latest report that production outpaced deliveries by 22 percent. Tesla said that was due to “challenges encountered for the first time” from a “massive increase” in orders from Europe and China. All the demand in the world won’t matter if Tesla fails to produce and deliver its vehicles.